A great textured cup of coffee in the morning makes your whole day refreshing and energizing. But making a perfect cup of coffee is extremely state of the art. Well, if you are an intense coffee lover, it is really obvious that you really go down for its perfect texture, aroma, and taste. Now if you thought that you can get a perfectly textured, brewed, and aromatic coffee only in coffee shops, you are absolutely wrong. Say thanks to the smart Coffee Machines/Espresso machines that is the best gift to all coffee enthusiasts. 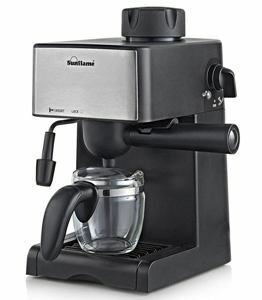 You can incredibly make amazing super rich coffee whether it is cappuccinos, espressos, or plain coffee very easily from the comfort of your home with these espresso machines. Now you don’t need to regularly visit the coffee shop when you own the best coffee machine at your kitchen countertop. Make the coffee of your own taste whenever you want without any hassle. Espresso Machines are the most versatile units that make a unique shot of coffee rich in flavor and texture. Basically, it comes in three different types to choose from. Manual Espresso Machines- These machines give you the full flexibility to make any type of coffee of your own choice whether it is espresso, ristretto, latte macchiato, or cappuccino. These are mostly found in the coffee shops. A filter basket is there to place the coffee grounds, and then the coffee grounds are compressed down. The machine then flows down the hot water over the coffee ground with pressure, resulting in a shot of espresso. The only downside with these machines is that you need manually to grind the coffee beans and froth the milk. Bean-to-Cup Espresso Machines- These are the most convenient units that take care all of your coffee grinding to pouring coffee automatically. You just need to pop out the water and coffee beans in the machine and get a shot of espresso coffee in just one touch of a button. The only downside is that these units require some extra care and maintenance. And you have to clean it regularly and empty the coffee grounds after every use. Pod Espresso Machines- These are the most costlier option, but in terms of convenience Pod Espresso Machines are the best choice rather than the other two. The machine runs on the pods of coffee that you drop into it. Just tap the button and get your perfect espresso coffee ready in no time. The best part is that you can make a variety of drinks on the basis of flavors and choices available depending on your mood. Well, this blog is dedicated to all coffee lovers in which we have covered the best and latest models of espresso machines. So if you are planning to buy the perfect one, just go through the list we have made as well as the full review of each model. And get a perfectly home-made coffee of your own choice whether it is cappuccino, macchiato, espresso, or just plain white coffee like the professional coffee makers. 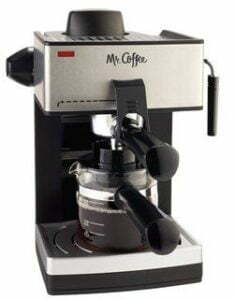 The brand Mr. Coffee has been involved in brewing coffee since 1970, and so for this espresso machine, the quality is fully assured. This wonderful espresso machine lets you make not only espresso but also cappuccino and latte in just one touch of a button. The machine comes with a powerful frother that whips up the cappuccinos and lattes and gives it a smooth, frothy and light texture. It also has the removable drip tray and frothing aids that make the cleaning of it super easy. This one in our list is also the best choice for your kitchen. 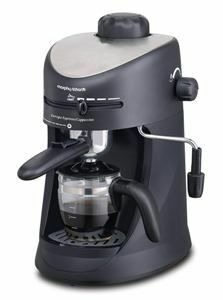 Get an extremely super-rich, and smooth textured coffee in no time with this espresso machine from Morphy Richards. It comes with a sleek glass carafe that is equipped with a heatproof handle letting you hold it properly and safely. There is a detachable drip tray that you can easily remove to clean it. It also comes with a stainless steel 2-Cup filter ensuring that you can only get the filtered and clear coffee every time. 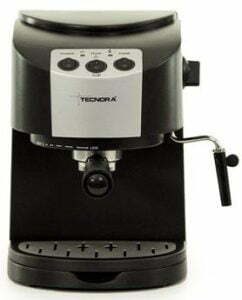 Bring the coffee making process to the next level with this espresso machine from Tecnora. Get the cafe experience from the comfort of your home with this advance Espresso Machine. It comes with 1050 W of power that boosts the efficiency of the boiler and also gives a greater consistency of steam to froth milk for a perfectly textured coffee. The machine also comes with a single boiler thermoblock that makes sure the correct temperature setting so that your coffee cannot get burn. Make your favorite latte and cappuccino in just one touch with this smart espresso machine from Morphy Richards. The machine makes 4 espresso shots in one go. The stylish and classy look of this machine appeals to your kitchen interiors. The machine performs the perfect frothing and thus offering the perfect coffee experience. 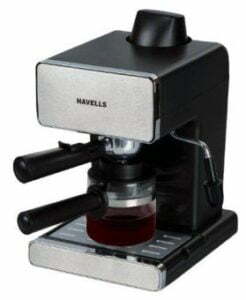 Havells Donato Espresso Machine is one of the best choices for all coffee lovers who want extremely rich coffee from the comfort of their home. 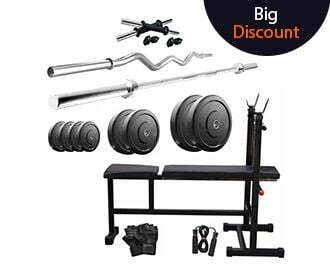 This machine is designed so sophisticatedly that even a pro can use it without any hassle. It comes with a glass carafe along with the neat handle to hold it properly and make 4 cups in one go. The machine also comes with a detachable nozzle and drip tray that makes the cleaning of it super easy. 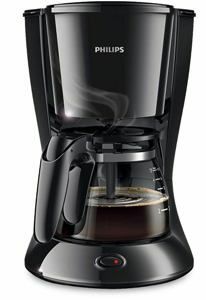 With such an affordable price range, the Philips HD7431/20 Coffee Maker is an ideal choice to get the perfect espresso shots from the comfort of your home. Its stylish, smart, and compact design is perfect to brew 2-7 cups in one go. It comes with an Aroma Twister nozzle that evenly mixes the filter coffee with the coffee in the jug to get an optimal and consistent aroma from the first to last cup. There comes an LED power switch that lights up when the coffee maker is switched on. Also, the machine has an easy water level indication for easy filling and drip stop. Plus, the dishwasher safe parts enable you to clean them very easily. 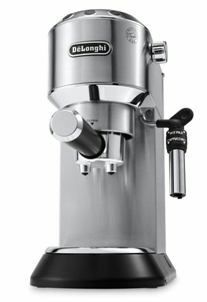 With a sleek and ultra-compact design, this espresso machine from the international brand DeLonghi is yet another smart choice. Get the barista style espresso and cappuccino experience with this machine and share it with your loved ones too. 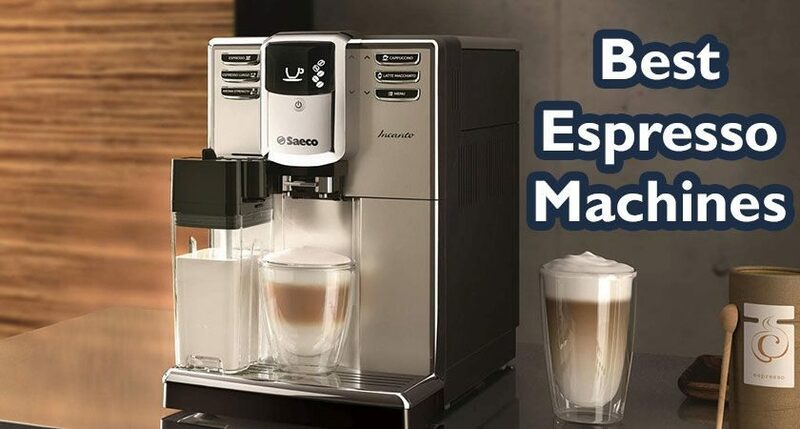 This espresso machine comes with a patented manual cappuccino system that lets you get the richest, thickest, long lasting foam for a superior beverage. There comes the 3-in-1 filter holder that can accommodate single shots, double shots and easy serving espresso pods. 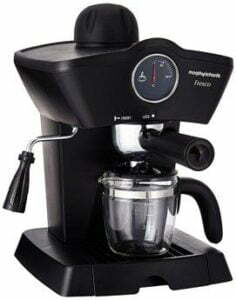 This coffee machine also comes with the thermoblock technology that offers you the ideal brewing temperature for making perfect espresso shots. It comes with a unique flow stop feature that lets you customize your perfect beverage. Plus, its adjustable cappuccino system enables you to brew a wide range of milk-based beverages including hot milk, milk froth for cappuccinos and hot water for teas and infusions. 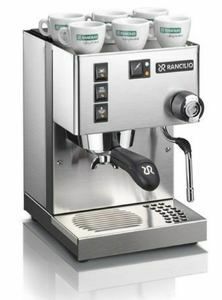 This espresso machine from the international brand Rancilio Silvia can simply be described as smart, reliable and powerful. 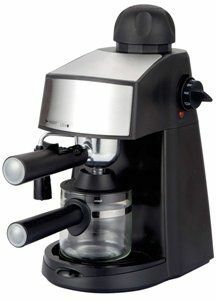 This one is a great buy for producing excellent espresso and silky microfoam milk for your lattes and cappuccino. When it comes to design its brushed stainless steel case, rust-resistant steel frame, stainless steel bolts, and screws, heating element and only the finest fittings and tubing give this machine a sleek, industrial and functional look. It comes with a 15 Bar heavy-duty pump that effectively force water through your coffee grounds and extract the full flavor. The capacity of the water reservoir is 2 quarts that can be removed and filled from the top anytime while the machine is in operation mode. This one is also featured with an articulating stainless steel steam wand that allows for a complete range of motion for steaming perfect latte quality milk. And the best part is that you can easily control the steaming power with the commercially designed steam knob. There comes the removable drip tray that is very much easy to clean. And there is also a warming surface on the top of the machine that allows you to warm your cup before you pour your espresso and thus keeping it at the right temperature. So, the next to make authentic style espresso, cappuccino, Americano’s and Latte with ease is this espresso machine from Russell Hobbs. The appliance comes with 3.8 bar pressure to make espresso, hot drink, and froth milk. It is also featured with stainless steel filter, die-cast funnel and detachable drip tray that ensures convenient cleaning. You can easily control the machine with its semi control knob and coffee strength selector. And the 4 cup capacity stainless steel filter enables consistency in your preparation. This advanced and smart espresso machine from Sunflame is another great choice for all the coffee enthusiasts. With its compact and stylish design, this coffee maker perfectly fits even the small kitchen spaces. It can deliver the great textured four cups of coffee in one go. The machine is featured with boil dry protection mechanism that indicates whether the machine is low on water or there is no water in the water tank. And the power on indicator lets you know that the machine is functioning. It also comes with a steam nozzle that can do milk frothing for a perfectly textured and rich creamy coffee at home. The advanced safety features include a safety pressure release valve that protects the internal components of the appliance from getting damaged due to overheating. Plus, the stainless steel and glass carafe gives an elegant look to this espresso coffee machine. This is all about the best espresso machines you can buy to make a perfect cup of coffee from your own hands. No hassle and no mess, these machines are even the affordable option for your full day refreshment. So pick the best one on the basis of your budget preferences and requirement. And if you think anything is missing, or if you have any suggestion regarding the blog, please pen down to us in the comment section below.